Missed out on future:gas Stationary 2017? All six future:gas presentations as delivered during the Brisbane seminar in July 2017 are now online, with access available for just $10 accompanied by a SlideShare of the presentation slides. We wanted to make sure we delivered this important information in the most valuable way possible, so rather than just providing the PowerPoint slides as a download we created six films featuring both the speakers and the slides they used, so you can experience each presentation as clearly as if you were there on the day. Seven of the refrigeration and air-conditioning industry’s top experts are headlining this year’s future:gas refrigerant seminar series, which start next month aimed at businesses and technicians in the working in installation, service and repair of refrigeration and air conditioning technology. The mid-week evening events will be held in 12 locations across Australia between June and September this year, delivering vital information to an industry that is now preparing for systems and equipment filled with or designed for a number of new refrigerants – HFOs, CO2, NH3, HCs and lower global warming potential (GWP) HFCs such as R32. These refrigerants and the components and systems designed for them will present significant changes to the tools, working practices, standards and workplace safety considerations relating to installation, repair, service and refrigerant recovery. Among the expert speakers are people from major global refrigerant and equipment manufacturers, Australian industry associations and the organisation that safely destroys refrigerant at end of life. Why existing refrigerants are being phased out and why supplies will remain for servicing older equipment. Introduction to HFO refrigerants and lower GWP HFCs such as R32, including a comparison with the products they are replacing. Introduction to CO2, NH3 and HC refrigerants plus their handling characteristics. Overview of the tools, working practices and equipment standards from a contractor’s perspective. Master of Ceremonies, providing an introduction to how RRA helps keep our industry clean. 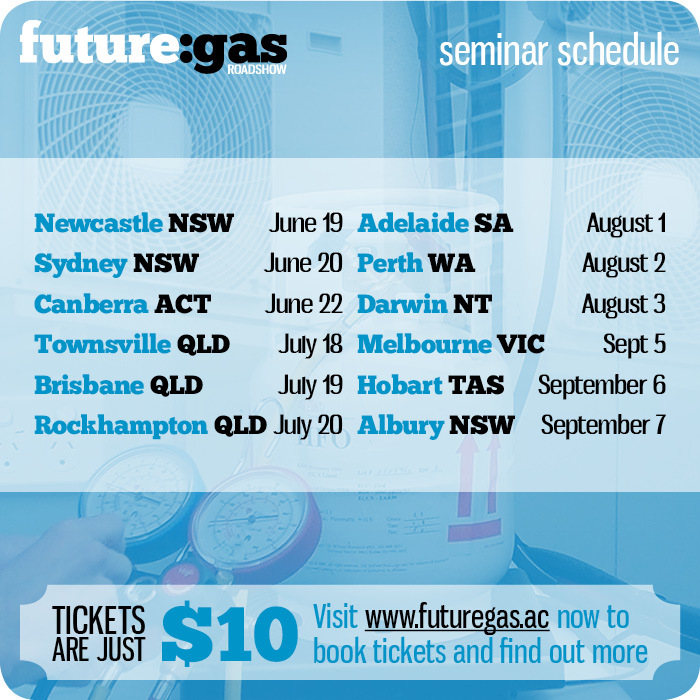 Kicking off in Newcastle, NSW on June 19, the future:gas seminar roadshow will conclude in Albury, NSW on September 7. Seminars will also be hosted in Adelaide, Brisbane, Canberra, Darwin, Hobart, Melbourne, Perth, Rockhampton, Sydney and Townsville. Conveniently timed on mid-week evenings with entry priced at just $10, future:gas seminars are designed to be as accessible as possible to those working in refrigeration and air conditioning. Attendees to future:gas seminars will be among the first in Australia to receive a comprehensive overview of new-generation refrigerants and the related technologies in one knowledge-enhancing evening. Following a successful pilot event in Sydney in February, spaces at this industry-led education initiative Spaces are limited, so early booking is advised. 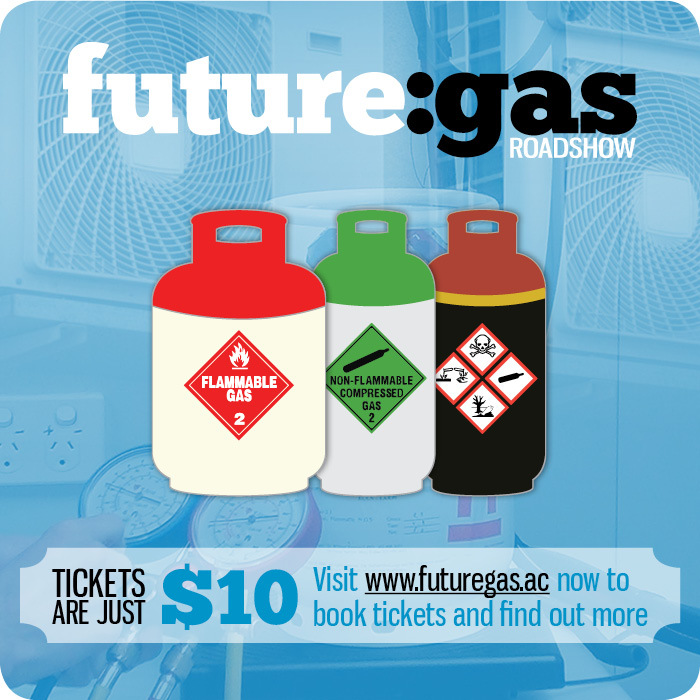 Tickets are heavily subsidised by contributions from industry associations and corporate sponsorship, priced at just $10 per delegate and available from www.futuregas.ac/stationary/ through a secure online booking system. Since ozone layer damaging CFC refrigerants were phased out in the mid-1990s, the mainstream refrigerants used have been HCFC and HFC. With climate change now on the agenda, systems using some HFC refrigerants will be phased out of use over time. HFOs, CO2, NH3 and HCs do not deplete the ozone layer and have much lower global warming potential ratings, as do lower GWP HFCs such as R32. New system designs will also have reduced power consumption and refrigerant leakage. Refrigerants Australia (peak organisation representing Australian refrigerant suppliers and users), Refrigerant Reclaim Australia (product stewardship organisation for the Australian refrigerants industry), the Refrigeration and Air Conditioning Contractors Association (RACCA), the Air-Conditioning and Refrigeration Equipment Manufacturers Association of Australia (AREMA), the Air Conditioning and Mechanical Contractors’ Association (AMCA) and licensing body the Australian Refrigeration Council (ARC), identified a need for a seminar roadshow designed to inform and educate thousands of technicians and businesses about the new refrigerants and technologies they will soon be encountering. Much of the refrigeration and air conditioning industry lacks awareness or is confused by conflicting messages or misinformation about the new HFOs, CO2, NH3, HCs and lower GWP HFCs such as R32, so there is a pressing need for this campaign of seminars, which will be made up of presentations from highly credible sources. Topics covered will include technological background, reasons for the phase-down of HFCs and the impacts these will have on their equipment, skills and safety practices. Among the target audience are: technicians, contractors, suppliers of products and services to the trade, and equipment owners. Created by industry, for industry, future:gas was originally run for the automotive sector in 2016 with great success and gained international attention as the first refrigerant education campaign of its kind in the world. The 2017 stationary sector roadshow builds on this proven successful format. Businesses and technicians in the business of refrigeration and air conditioning installation, service and repair need to prepare themselves for systems and equipment entering the Australian market filled with or designed for the many new refrigerants – HFOs, CO2, NH3, HCs and lower GWP HFCs such as R32. This year, tens of millions of new systems designed for new low global warming potential HFOs, CO2, NH3, HCs and lower GWP HFCs such as R32 will be produced around the world. In the near future it is expected that every new piece of refrigeration and air conditioning equipment sold in Australia will use one of these refrigerants. 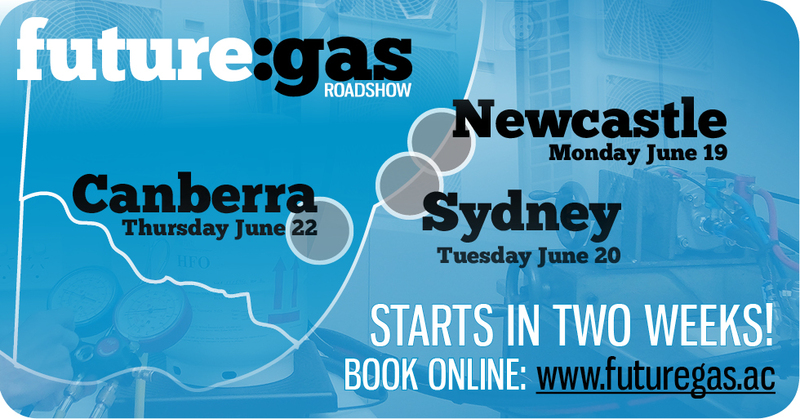 Following a successful pilot event in Sydney in February, an industry-led education initiative called future:gas will deliver seminars about these new technologies and the reasons they came about at 12 locations around Australia between June and September this year. Each future:gas seminar will feature presentations from top industry experts, who will explain the reason for the changes, the technical background of the new refrigerants, new safe working practices and standards relating to the quality and design of both components and service equipment. Spaces are limited, so early booking is advised. 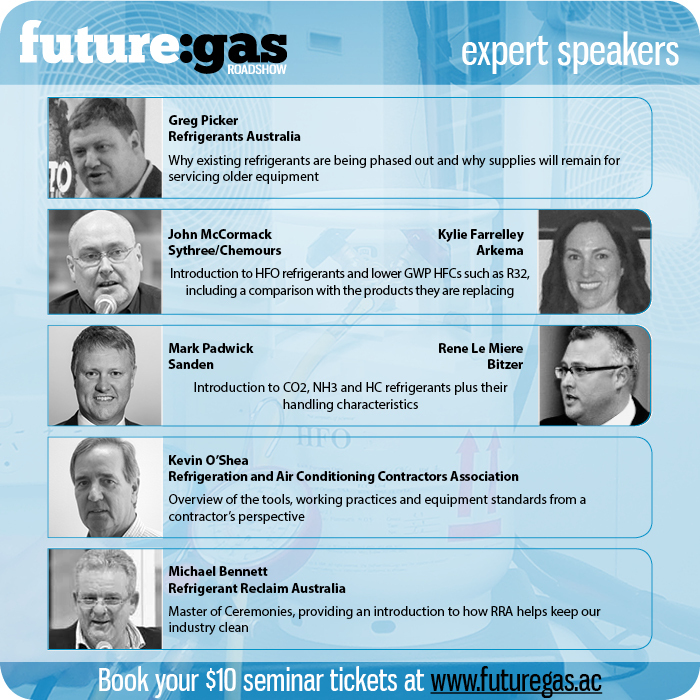 Tickets are heavily subsidised by contributions from industry associations and corporate sponsorship, priced at just $10 per delegate and available from www.futuregas.ac through a secure online booking system. Over time, the futuregas.ac website will become an information resource for the numerous new-generation HFOs, CO2, NH3, HCs and lower GWP HFCs such as R32. HFOs, CO2, NH3 and HC refrigerants do not deplete the ozone layer and have much lower global warming potential ratings, as do lower GWP HFC refrigerants such as R32. New system designs will also have reduced power consumption and refrigerant leakage. Refrigerants Australia (peak organisation representing Australian refrigerant suppliers and users), Refrigerant Reclaim Australia (product stewardship organisation for the Australian refrigerants industry), the Refrigeration and Air Conditioning Contractors Association (RACCA) and licensing body the Australian Refrigeration Council, identified a need for a seminar roadshow designed to inform and educate thousands of technicians and businesses about the new refrigerants and technologies they will soon be encountering. 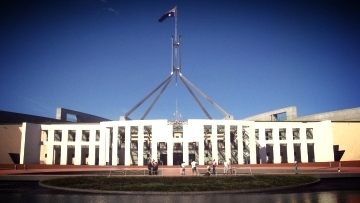 THE Australian federal government introduced legislation to Parliament on March 30 that will bring about the nation’s HFC phase-down, in compliance with the Montreal Protocol, which was amended at a historic meeting in Kigali, Rwanda last year to include high global warming potential (GWP) HFCs. Under the Ozone Protection and Synthetic Greenhouse Gas Management Amendment Bill 2017, HFC imports will be phased down from January 1 next year, with a target of reducing imports by 85 per cent by 2036. HFC emissions from refrigerants, fire extinguishers and foam blowing currently account for around two per cent of Australia’s greenhouse gas pollution. The new legislation will enable new regulations to be introduced, including bans on importing equipment that uses high-GWP refrigerants. Across the refrigeration and air-conditioning industry, the HFC phase-down has been welcomed as providing business with long-term certainty as well as guaranteeing improvements to the environment. Providing further certainty, the legislation is expected to pass through both houses without controversy. In addition to the Australian effort, all signatories to the Montreal Protocol have pledged to reduce HFC emissions, the effect of which is estimated to reduce global carbon dioxide equivalent emissions by up to 72 billion tonnes by 2050. For perspective, this figure is equal to around 1.3 times the amount of the entire world’s annual carbon emissions. Refrigerants Australia executive director Greg Picker predicted the local HFC phase-down will reduce Australian carbon-equivalent emissions by 80 million tonnes by 2030. “In shifting from ozone depleting substances in the 1990s, the refrigeration and air conditioning industry has already delivered more emission reductions than any other sector of the Australian economy,” he said. The Montreal Protocol was originally conceived to save the ozone layer by banning CFCs such as R12 and was so successful that it became the basis of a global HFC phase-down. Thanks to the Montreal Protocol, the ozone layer is expected to recover by the 2050s for the majority of latitudes, with the Antarctic ozone hole predicted to be gone by around 2070.